If you're totally satisfied with your life, don't bother to read this. However, if you wish to be more than you are...if you wish to be great at what you do, this could change your thinking...thus, your life!" 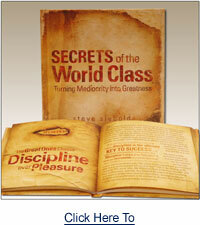 Steve Siebold is a "world class" guy who has written a "world class" book about how to turn mediocrity into greatness. Here's what he had to say: "Starting in 1984, I spent every free moment conducting interviews with champions, reading their books and studying everything I could get my hands on about psychology of peak performance. My friends said I was obsessed. They were right. This book is the result of my 20-year obsession." Steve is an internationally recognized expert in the field of peak performance and mental toughness. He's spoken to many Fortune 500 companies and other companies around the world. Also, he was recently on the Larry King show and the Today Show sharing what he has learned in his search for the keys to greatness. Today, I'd like to share Steve's introduction for a terrific new book from Simple Truths: Secrets of the World Class...Turning Mediocrity into Greatness. Enjoy! Introduction from: Secrets of the World Class, by Steve Siebold I have had the privilege of competing against, coaching, being coached by and observing world-class performers since I was six years old. As a junior tennis player competing throughout the United States from ages 7 - 18, I became fascinated with what it takes to become a champion. My dream was to be ranked among the Top 10 players in the world, but I fell short. At my best, I hovered around the Top 500 in the world, and that's as high as I could seem to reach. Deep down, I knew I had the talent to make my dream a reality, and I knew the missing link was mental. After I hung up my racquet for the last time, I became obsessed with uncovering the mental toughness secrets of champions. Starting in 1984, I spent every free moment conducting interviews with champions, reading their books and studying everything I could get my hands on about the psychology of peak performance. My friends said I was obsessed. They were right. This book is the result of my 20-year obsession. When I started to implement the ideas in this book, my whole life changed. It wasn't overnight, but sometimes it seemed like it. There's no magic here, just practical thought processes, habits and philosophies drawn from the greatest performers in the world. This book contains no theories. Every secret comes straight from the street of experience, either my own or that of our clients. This book is loaded with ideas you can implement immediately. Some will be familiar and some new. All of them have the power to catapult your results, no matter how high you're flying. It's been said that speakers and writers espouse wisdom on the very topic they need most. Now that you know my story, you know this is true for me. After 20 years of studying and teaching mental toughness to people throughout the United States, Canada and 10 other countries, I can honestly tell you that many times I still think like a complete amateur, operating out of the same middle-class consciousness that I ridicule in this book. After all these years, my mental toughness growth is still a work in progress. The good news is that mental toughness is a skill that can be learned, and the tougher you get, the bigger you'll dream and the more fun you'll have. Secrets of the World Class Do you see yourself as middle-class or world-class? No, I'm not talking about what's in your bank account. I'm talking about what sets world-class performers apart from those who are just "average," no matter what their profession. Steve Siebold, an internationally recognized expert in the field of peak performance and mental toughness, spent more than 20 years conducting interviews with champions, researching the psychology of peak performance and learning what sets world-class performers apart. Already own this book? Review it here! He has shared his findings with Fortune 500 companies around the world and now in his terrific book from Simple Truths, Secrets of the World Class: Turning Mediocrity into Greatness.